He has one of the coolest names ever for an MLB player. Before Muddy Ruel became the greatest catcher in Washington Senator franchise history, he shared the New York Yankee starting catcher responsibilities during the 1919 and 1920 seasons with fellow receiver Truck Hannah. Despite being physically small for his position at 5’9″ and just 150 pounds, Ruel became one of the best defensive catchers in league history. There was nothing he could not do well from behind the plate and despite his diminutive size, Ruel was famous for his refusal to back down from much larger hard-charging base runners attempting to score. He was also a skilled hitter, averaging .275 during his 19 big league seasons. With New York, Ruel averaged .251 during his two seasons in the Bronx. The Yankee team he joined as a 22-year-old had not yet acquired Babe Ruth from Boston but it was a quickly-improving ball club under the control of its talented skipper, Miller Huggins. Ruel started 69 games behind the plate for Huggins in 1919 and 76 more the following year. He was behind the plate in the August 1920 game, when New York pitcher Carl Mays beaned and killed Roy Chapman of the Cleveland Indians. Ruel would be asked about that tragic event for the rest of his days and always insisted Mays was not trying to hit Chapman. When Ruth joined the team during Ruel’s second year as a starter, the Yankees instantly became one of the better teams in baseball and Ruel’s future with the emerging dynasty looked strong and secure. But that future ended abruptly in December of 1920, when the Yankees and Red Sox pulled off a huge eight player trade. The key players involved were Yankee second baseman Del Pratt and Boston pitcher Waite Hoyt, but the transaction also included a swap of the two teams’ catchers, Ruel for Wally Schang. Muddy would start behind the plate for the Red Sox for the next two years and then get dealt to the Senators, where he would be paired with the immortal Walter Johnson, to form one of the great batteries in baseball history. The pair would lead Washington to the only two World Series appearances in that team’s long history in 1924 and ’25 and it would be Ruel who would score the winning run in the seventh and final game of the 1924 Fall Classic that earned that ball club its one and only world championship. 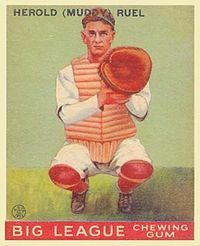 Ruel played for the Senators through 1930 and then spent the last four years of his playing career with four different teams. He had earned his law degree during his off-seasons with Washington, but instead of practicing law when his playing days were over, he went into coaching, then managing, then front office work and even became a special assistant to Baseball Commissioner, Happy Chandler for a while. He finally left the game for good in 1956 and moved to Italy for a year so his children could have the experience of attending school abroad. Ruel died in 1963 from a heart attack at the age of 67. Ruel shares his birthday with Old Reliable, this former Yankee outfielder, this brand new Yankee catcher and this one-time Yankee pitcher.